Restorative justice invites us to cultivate moral imagination, to watch vigilantly for creative ways to heal pain caused by violence and build spaces for transformative encounter to take place. Fr. Paul Morrissey shares how he did this in an unlikely corner of Philadelphia. His reflection on events of the past reminds us of our nation's ongoing struggles for racial justice today. 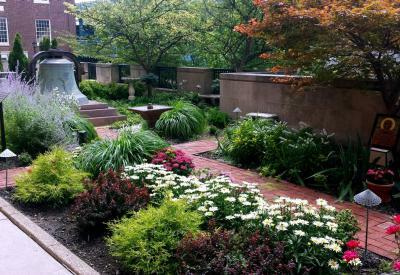 While serving as a chaplain in the Philadelphia Prison ten years ago, I noticed a garden of sorts near a nondescript graveyard next to our church. It was a small space, about 12 ft x 20 ft. The Ben Franklin Bridge overshadowed it and passing runners rarely glanced over at its overgrown bushes and plastic bag refuse. No one tended this garden. After coming home from the prison one autumn day, I felt drawn to do so. As I began to pull up weeds and sweep leaves off the cross-shaped pathway, a weathered brass plaque on the walls caught my attention. It read: “This garden is dedicated to Jeanne Clery.” Jeanne, I discovered, was a student at Lehigh University, a hundred miles north of Philadelphia, where she was raped and murdered in 1986. In their grief, her parents, Connie and Howard, told Jeanne’s story across the country. They demanded that a federal law be passed, requiring colleges and universities to report crimes of sexual assault and murder of students. In 1990, they succeeded passing The Clery Act, which does just that. Then, an idea came to me. A Peace Garden…wait, no…a Healing Garden, from which Jeanne Clery and persons like her can cry to God. That is what this place can be. The current Healing Garden blooms as a challenge to violence in our present as well as our past. St. Augustine Parish in Old City, Philadelphia, was founded in 1796 by the Irish Friars of the Augustinian Order of the Catholic Church. (I am one of these friars.) We weren’t very welcome by the 1840’s when The Nativist Party of the young American Republic was opposed to immigration, especially the large numbers of Irish fleeing poverty and hunger. In 1844, after days of increased rioting, a mob of “Nativists” torched St. Augustine’s, shouting anti-Irish and anti-Catholic epithets as the grand church burned to the ground along with another nearby church, St. Michael’s. The church was rebuilt during the following decade and stands today as testimony to that violence. One hundred and seventy years later in 2018, the Healing Garden blooms as a challenge to this prejudice and violence in our past and our present. With the volunteer help of many people involved with Adeodatus Prison Ministry, including former prisoners and those struggling with addictions, it has become a place of remembering, praying for and reconciling those who have been harmed by violence and prejudice in the greater Philadelphia area and beyond—victims, offenders, and their families. People who wish to commemorate a loved one, living or deceased, or anyone who desires healing, are memorialized on the bricks in the walkway. A bubbling water fountain welcomes the birds. Flowers, bushes, and a graceful Japanese maple tree create a space for people to meditate apart from the city’s rush and noise. A beautiful original icon, “Mary, Mother of Captives,” portrays the Mother of God clutching handcuffs over her heart —one open and one closed— a sign of her love for those imprisoned in any way. If you are ever in Philadelphia, come apart and pray awhile. Fr. Paul Morrissey, OSA is the founder of Adeodatus Prison Ministry and an Augustinian friar in Philadelphia, PA. Together, with Augustinian Defenders of the Rights of the Poor, he educates about restorative justice in schools, churches, and other venues throughout the city. He is also an active member of Philadelphia’s Restorative Justice Coalition with a number of other Catholic individuals and agencies. To contact Adeodatus Prison Ministry, call 215-925-3566 Ext 108.